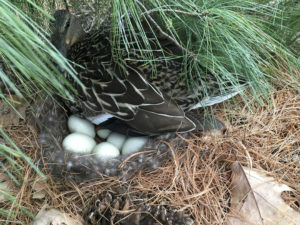 In our continuing journey, Mama Duck has hatched her eggs and her little brood headed for water. She said goodby as she got ready to leave but I missed the departure. As the last egg is laid, the female starts to incubate. She rarely leaves the nest apart from short breaks. About 28 days later the eggs hatch together. This takes about 24 hours. The ducklings stay in the nest for at least 10 hours while they dry and get used to using their legs. Then, usually in the early morning, the female leads them to water. It is probably a good thing I missed it, as you aren’t supposed to scare them during this time and taking pictures might have made them all run in different directions. So the fencing came down and my dogs have checked out their territory and declared it theirs again. We wait for the next wildlife adventure. Are you continuing your journals? What feelings did your journal reveal? How is your journey of self-discovery coming along? Are you hitting roadblocks? I finished my first Ta’i Chi classes, but I fell this weekend and will have to wait until my knee heals. Again life’s little happenings. I stubbed my toe on the rubber on a speed bump. Although it is aggravating, as I didn’t do this before the accident, I am healing and sending positive thoughts to my bruises. The only thing I can think of that depicts the fall is SPLAT!!! like the comic books. Trying to see the humor in this :). Laughter is the best medicine. How are your exercises? Have you tried any of the exercises I suggested like chair yoga or water yoga or Ta’i Chi? Environmental wellness is important for our health and the health of Mother Earth. My trees must have reached a new maturity this year. They were planted 10 years ago and were good sized at the time. I have lots of birds and wildlife this year. A mother robin has decided to make her nest in a pine tree right across from my deck steps. She has been bombing my dogs as they go outside. They now wait for me to go with them. And I always feel it is spring when the little jenny wren appears in my front yard. 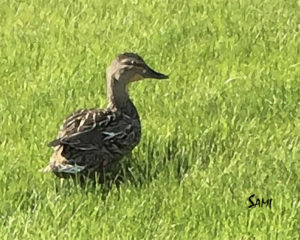 My traveling companion, Mama Duck, is still sitting on her eggs. Last week we started our journals. What feelings did your journal reveal? How is your journey of self-discovery coming along? I am finding my mindfulness meditations with the Ta’i Chi exercises to be very relaxing. They keep me centered and help me release my energy. Having an injury can block our energy and that can keep us from healing. How are your exercises? Have you tried any of the exercises I suggested like chair yoga or water yoga or Ta’i Chi? Even with physical disabilities, it will help your flexibility and growth. I was able to swim another lap this week with less pain. The Ta’i Chi is helping with my breathing and energy as well. Another fun exercise is a lazy river where you walk in a pool and either walk with the current, or against the current. The lazy river is a low-impact workout and great for joints. If you have sore joints or if you’re recovering from some sort of injury, this is a perfect opportunity to use water therapy. I go to the local recreation center at least once a week to walk the lazy river and then swim at least one lap.